Released on new Icelandic imprint Bedroom Community, set up by record producer and Björk collaborator Valgeir Sigurðsson, Speaks Volumes is the debut album from twenty-four year old composer and musician Nico Muhly. Born in Vermont and raised in Rhodes Island, Muhly studied composition at the Julliard School. He has since worked with Antony & The Johnsons, orchestrated the score for The Manchurian Candidate in 2004, collaborated with Björk on Medúlla and conducted the score for Matthew Barney’s Drawing Restraint 9, once again working in partnership with Björk. Speaks Volumes is a fascinating collection of complex and delicate chamber music pieces framed with discreet electronics. While the seven tracks presented here all share rather austere attires, developed from few instruments at a time, there is, running through the whole album, a deep sense of musicality which gives it a surprisingly light and airy appearance. 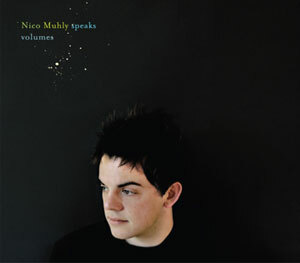 Although his music can at times seem somewhat serious and conceptual, especially on the textural and moody Clear Music, with which he opens, or on the complex and expressionist Honest Music, Muhly deflects the tention by projecting playful elements at the forefront of his compositions, from the relentless clarinet pursuit of It Goes Without Saying to the swelling waves of piano and celesta fighting out for attention on Pillaging Music. Elsewhere, Muhly adopts a rather more stern approach on the superb Quiet Music and A Hudson Cycle. Both pieces, interpreted by Muhly on the piano, are short and introspective, but, whereas the former shows strong spiritual and cinematic overtones, the latter is a much more subtle and fragile composition. Originally created as a wedding gift for two friends, the piece is at once melancholic and uplifting and pays a noted homage to the work of Philip Glass, which Muhly cites as one of his most important influences. The closing track is a much more experimental and intriguing composition. Keep In Touch opens with a lonely viola drawing a pseudo improvised arabesque before being joined by Antony on vocal duties. This is perhaps the most demanding moment on this album, but the dense canvas formed from the alternatively plaintive and abrasive instrument and the mournful hums and hoos, with background electronics progressively adding grit to the mix, serves the intrigue surprisingly well and brings this album to an end in a rather unexpected fashion. While Nico Muhly has been getting noticed for his work for a while, with compositions performed on both sides of the Atlantic, this first collection, as eclectic and disparate as it is, is certain to raise his profile and put the fledgling Bedroom Community imprint on the map.